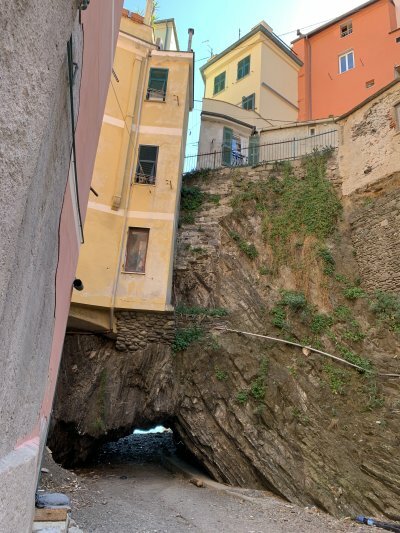 Cinque Terre (Five Lands) is a coastal area in northwest Italy on the Ligurian Coast consisting of five villages within the Cinque Terre National Park, a UNESCO World Heritage Site. 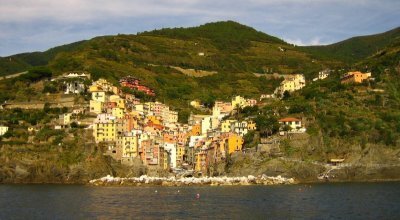 The five villages are Monterrosso Al Mare, Corniglia, Vernazza, Manarola and Riomaggiore. The five villages are set in the cliffs overlooking the ocean and are joined together by hiking trails between the towns. The rugged cliff terrain has been terraced with vineyards and olive trees. Five thousand people live in these remote villages. 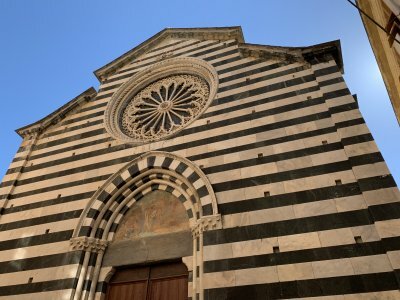 You can drive to Cinque Terre but the easiest way is to take a train either to Monterosso or La Spezia, Riomaggiore or Vernazza. 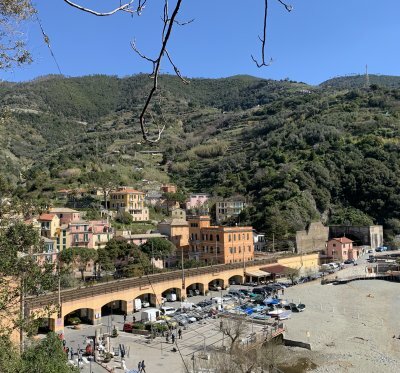 We took the train from Santa Margherita Ligure to Monterosso Al Mare. 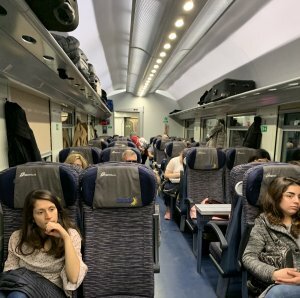 The Italian Rail System (Trenitalia) is excellent. 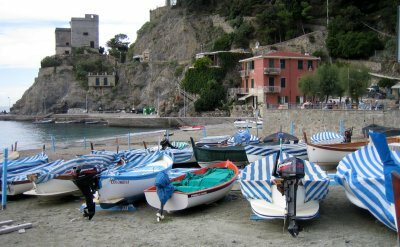 There is also a ferry from Santa Margherita Ligure that will take you to Cinque Terre. 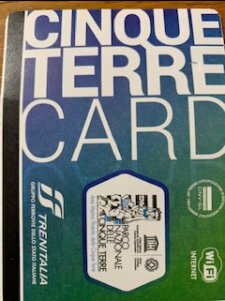 Besides your regular train ticket, you will also need to purchase from the train station, Cinque Terre Card or a Cinque Terra Hiking Cards. They come in 1, 2 or 3 day passes. You will need to validate your pass before you get on the train. 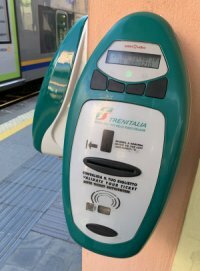 These are the ticket validators that you would use for validation of the pass or for any open ticket on Trenitalia. You will find them at the train station. The largest and most north of the villages. Dates from 1200 AD. 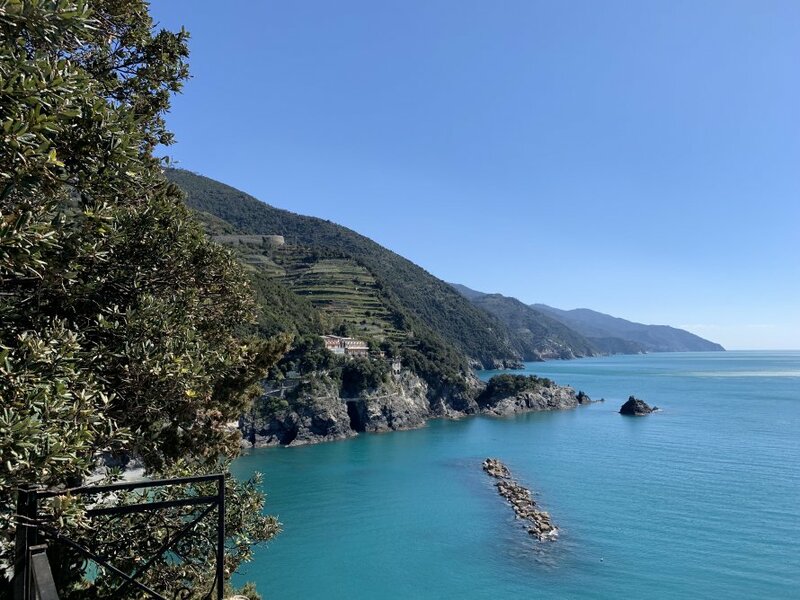 View of Cinque Terre region from Monterosso al Mare on the Ligurian Sea. 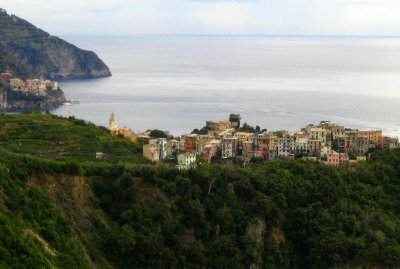 The 5 villages are part of the Cinque Terre National Park. This photo shows you the cliffs where the five villages are located. You can see some of the other villages if you look closely. Medieval bell tower and to the right downtown in the old city. 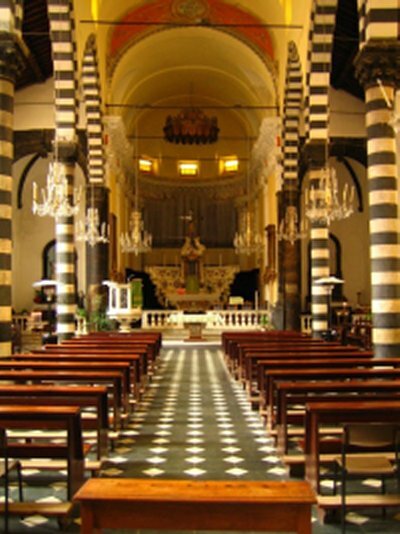 Church of San Giovanni Battista was completed in 1307 and is covered in black and white marble. To the right is a photo taken by Steve Meyers inside the church. 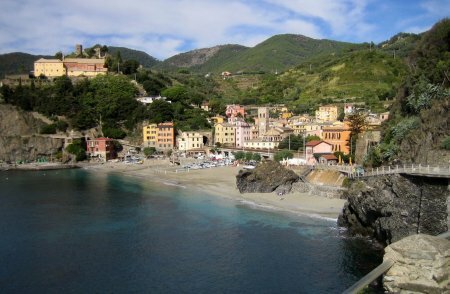 One of the beaches in Monterosso. Photo by Steve Meyers. 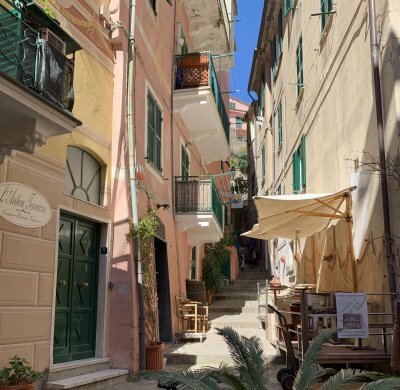 Two views of Monterosso al Mare. The second photo shows the hiking trail. 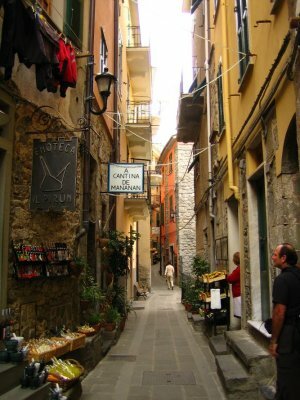 Monterosso is the largest of the five towns in Cinque Terre. Photo above: Courtesy of Steven Meyers. The village dates back to 1090. You can reach the town by boat, train or by a hiking trail. 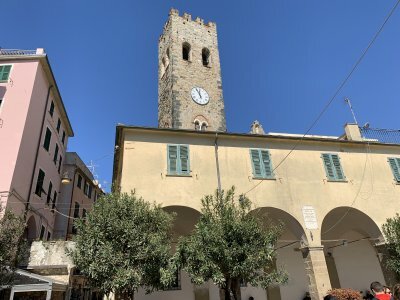 Photos above and below of the old town and the church of Santa Margherita d’Antiochia that dates from 1318. 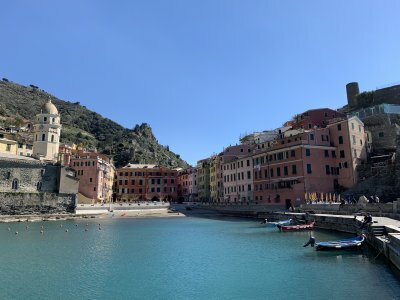 Left and right and right below: Three views of Vernazza taken by Steve Meyers. 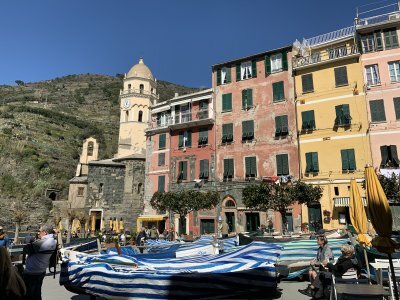 On October 2011 Vernazza had torrential rains, massive flooding, and mudslides and the village was buried in 4 metres of mud. The hole you see is where the water came into the city. The village dates back to Roman times and is high above the sea. 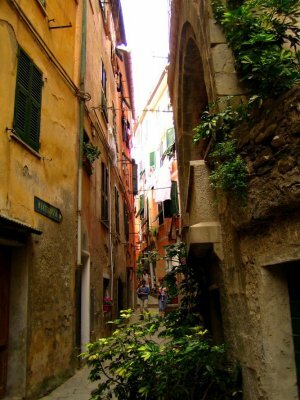 Views of Corniglia taken by Steve Meyers. 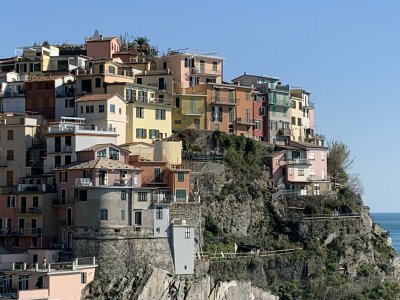 View of the next village over, Manarola, from Corniglia taken by Steve Meyers. 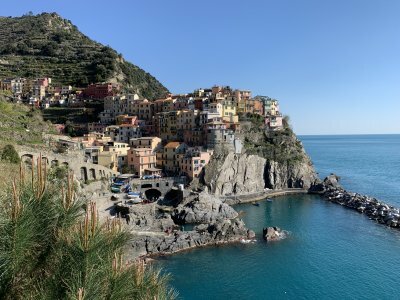 Manarola is the second smallest town in Cinque Terre. 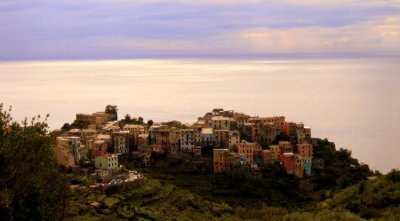 View of downtown Manarola. Photo by Steve Meyers. 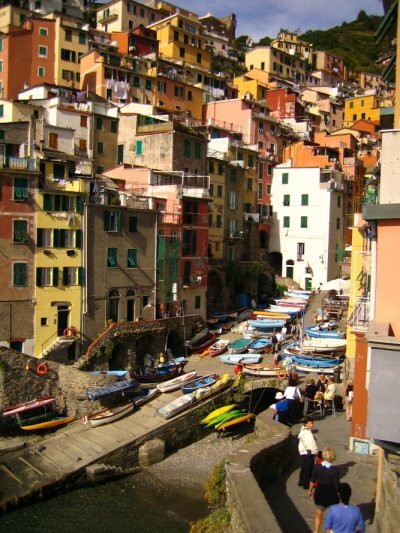 The Love Trail that goes between Manarola and Riomaggiore. 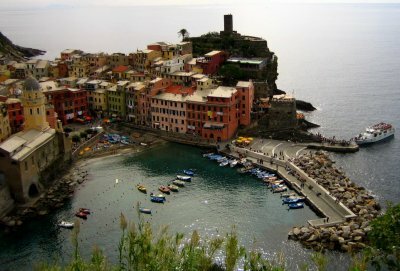 The first village of Cinque Terre after La Spezia. The village dates from the early 13th century. Riomaggiore photos by Steve Meyers. 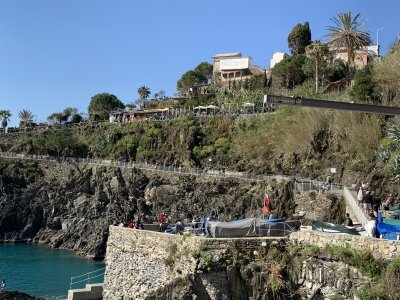 6.8-mile trail connecting Riomaggiore to Monterossa. 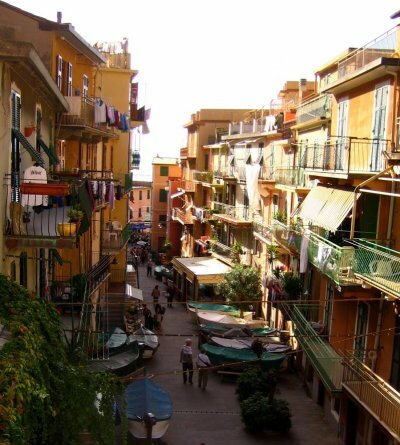 Riomaggiore to Manarola: .93 miles, easy, 30 minutes, also called “Lover’s Lane”. 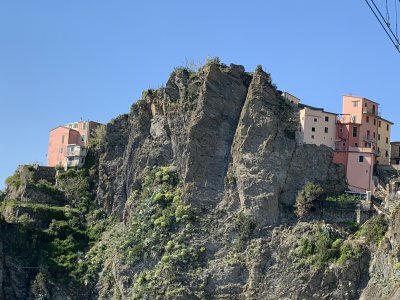 Manarola to Corniglia: 1.86, each, 1 hour. 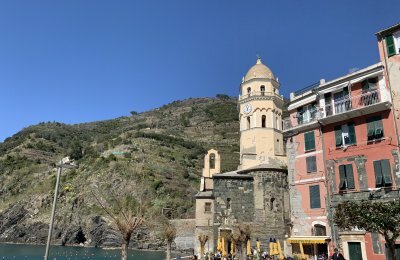 Vernazza to Monterosso: 2.17 miles, moderate, 1.5 hours. Photos by Christine Meny and Steve Meyers. 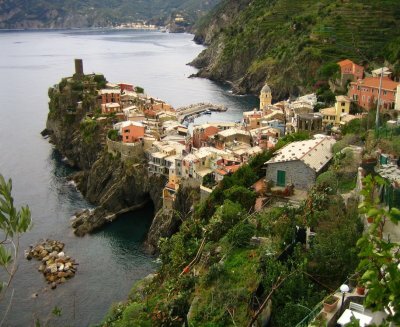 If you would like to go to the Cinque Terre, please contact Chris at (800) 597-0594.